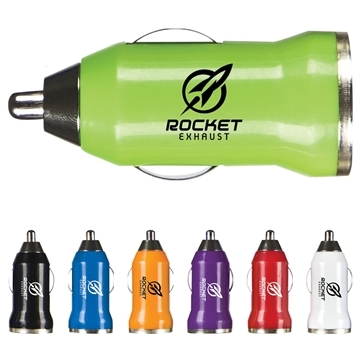 Conveniently charges cell phones, MP3 players and other electronic devices in your car via USB. Plugs into any standard cigarette lighter. Green LED indicator shows when device is charging. Peak output of 900mA and a continuous output of 600mA. Lightweight design in vibrant colors. It is the 2nd time I purchased this item and it certainly wont be the last. Rose was excellent, very organized and helpful. Good employee. My clients were very impressed with the quality of the product and they have requested that future items be selected from Anypromo. A great find for its price! Our clients loved them.